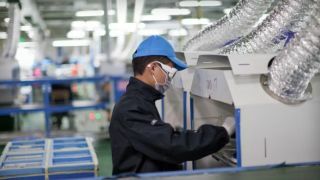 Taiwanese tech giant Foxconn has signed a letter of intent to invest $1 billion (£600 million, AU$1.1 billion) in Indonesia to diversify its production. Foxconn, also known as Hon Hai Precision Industry, is the world's largest contract electronics maker. The investments will be made in the Jakarta province of Indonesia, where a team has already been sent to plan construction. The investment aims to be completed in three to five years. The areas being invested in include research and development, electronics and software design and the manufacturing and assembly of electronic products for smartphones and tech. The move is designed to shift Foxconn's production away from China, where its facilities already produce goods for Apple, Sony and Nokia. Unlike those in China, the factories set up in Indonesia will be built to assemble products for local Indonesian customers. Smartphone penetration in the country is low, with only 23 per cent of mobile phone users owning one. Foxconn plans to build tablets, televisions and handsets for Indonesians and market them through partnerships with existing electronics brands such as BlackBerry, who signed an agreement with Foxconn in December 2013.